Available in Spanish, French, Chinese and Vietnamese. Includes translated: 10 inventory/check register; 25 Key cards; instructions, board squares. Available in Spanish, French, Chinese and Vietnamese. 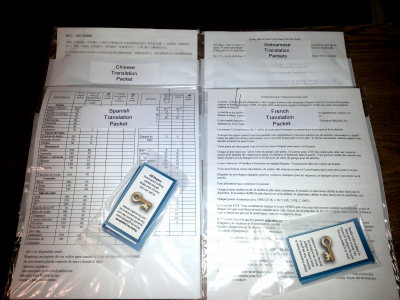 Includes translated: 10 inventory/check register; 25 Key cards; instructions, board squares. Players can take the board squares sheet, copy to an adhesive sheet, and cut and paste the squares onto the board itself. Or – just use it on the side as a help tool!